Manchester United have had a massive right-wing problem ever since Cristiano Ronaldo left Old Trafford. It’s an issue that has often been patched up rather than fixed for good. Now, though, it looks as though the Red Devils are trying to solve that. In an exclusive from The Sun, it is being claimed that United have ‘made contact’ with Jadon Sancho’s camp about the possibility of a £70million move for the 18-year-old. However, United will not have it all there own way. The report also states that Paris Saint-Germain are keen on the Englishman; and it’s not clear where his preferred destination would be. 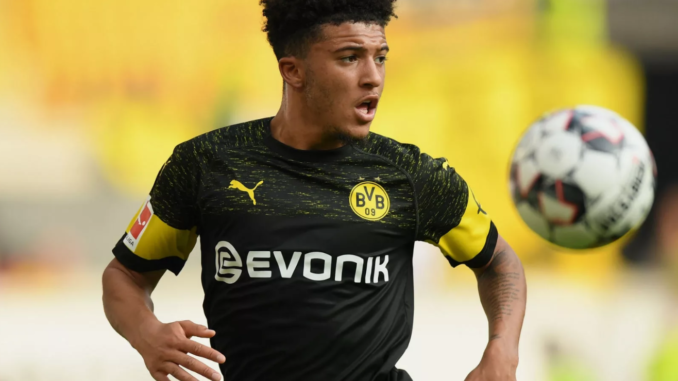 Sancho is enjoying a stellar breakthrough season with Borussia Dortmund in the Bundesliga – and he’s already making waves on the international scene, too. He was brilliant for England last night and it was great to see the young man thrive. Can you imagine how good it’d be seeing Sancho line up next to Marcus Rashford and Jesse Lingard for Manchester United? It really is the stuff of dreams and that English triumvirate would be something special to watch. Hopefully, Sancho chooses United Red, and we can get this deal over the line as swiftly as possible before other clubs start to show an interest. This boy is special.